THE IPOD TOUCH became the last iPod standing today as Apple removed nano and shuffle devices from its lineup. The late Apple co-founder Steve Jobs introduced the devices 12 years ago and the small, easy-to-operate players helped the company revolutionise how music was sold. Apple confirmed to AFP that it is no longer selling nano and shuffle, and the MP3 players vanished from the Apple website. “Today, we are simplifying our iPod lineup with two models of iPod touch now with double the capacity starting at just $199 (€170) and we are discontinuing the iPod shuffle and iPod nano,” the company said in an email. Industry trackers and Apple itself have long acknowledged that the do-it-all iPhone would eat away at sales of one-trick devices such as iPod MP3 players, so the farewell was met more with nostalgia than surprise. The trend toward streaming music services, including the launch of one by Apple, has made devices designed just for carrying digital tunes around less enticing for consumers. Shuffle devices, about the size of matchbooks and featuring click-wheels for control, debuted in early 2005, with Jobs touting that they let people carry broad libraries of music right in their pockets. 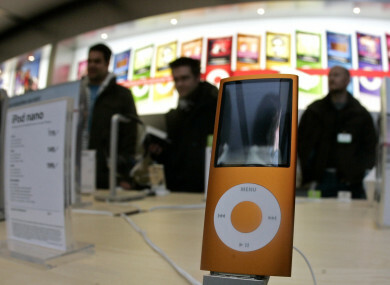 The iPod nano also hit the market in 2005, featuring click wheels and screens that improved the ability to select songs. Nano devices evolved with subsequent models, leading to one with a multi-touch screen and the look of an iPhone. Neither the shuffle nor the nano linked to the internet, instead relying on downloading music from Apple online shop iTunes through computers. Three years ago Apple discontinued the last version of the original iPod classic, introduced in October of 2001. The remaining products in the line are iPod touch models boasting much larger storage capacity and the ability to link wirelessly to internet hotspots for online content such as music streamed from services such as Apple Music. Email “Apple has cut the iPod nano and shuffle from its lineup ”. Feedback on “Apple has cut the iPod nano and shuffle from its lineup ”.